Yesterday an American court sentenced 86 years to a 38 years old neuroscientist Dr Afia Siddiqui on charges of “attempted murder”, which was committed in Afghanistan years ago. No one in the world gets 86 years for attempting to kill a person. Even the drama of “killing” the US soldier seems fabricated and seems to have planned only to indict the female doctor to settle some other scores. I would not go into the details of the attempted murder allegations. But would only say that no terrorist roams around in a city, infested with American soldiers and agents keeping an eye on every one, with a handbag containing maps of “sensitive places.” And when caught in the town of Ghazni, and taken to a police station, she picks up a rifle “innocently left by a marine” in the room where she was detained and opened fire on a US soldier and FBI agent. “Luckily” the Americans escaped the fire, but Dr Afia got injured instead by the fire they opened on her. Despite the fact that her finger prints were not found on the rifle she allegedly grabbed, she gets 86 years from the court of country always advocating upholding of justice. It seems as the verdict was just a ceremonious formality and the sentence had already been readied to be announced even if she was found not guilty. 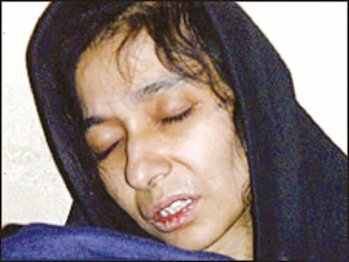 Have a closer look at the photo of Dr Afia, as it appeared in the newspapers around the world, which speaks of a women fatigued, tired and seemingly tortured. One only pities those who had detained her and found a fragile woman to torture to “get the truth.” And when nothing could be proved, she was sentenced to rot and be humiliated in some dungeon like cell of a prison all of her life. After yesterday’s verdict the judicial system of the USA has suffered a huge loss on moral, legal and logic planes. And if someone attempting a murder gets 86 years, what about those presidents and prime ministers who lied to the entire world that Iraq had amassed WMDs and an invasion by allies was essential to destroy those WMDs before the same destroyed the world? And in the process killed countless Iraqis, besides devastating a developed country and turning into a heap of rubbles. Shouldn’t they be held accountable for their deeds by this “supreme” law? I abhor terrorism of any kind, whether by the so-called Al Qaeda or the social terrorism as committed yesterday in the USA. The verdict shows the false pride of a nation that is highly prejudiced and unjust. The verdict is a mockery of the slogans of Liberty, Justice and Freedom. Weep, free world weep. One of your daughters has succumbed to the pride of nation and its prejudices.